Akumal does not have that many restaurants. Because they had karaoke on wednesday nights, we stopped by La Buena Vida for dinner. It’s on Half Moon Bay and there are several dining rooms. One is on the beach itself, which is where we were. There’s also a bar which is covered, but also pretty much outside. There is an indoor dining area on the second floor. One of the coolest tables they have are the treetop tables. 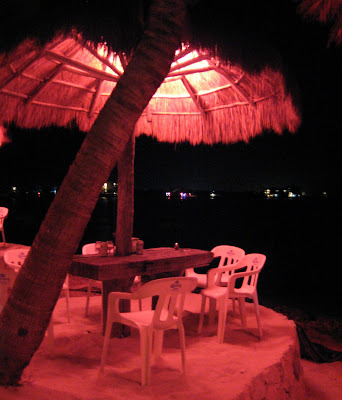 There are tables built into the top of the palm trees where they rope up the food / drink to you in a bucket. Pretty cool if you ask me. 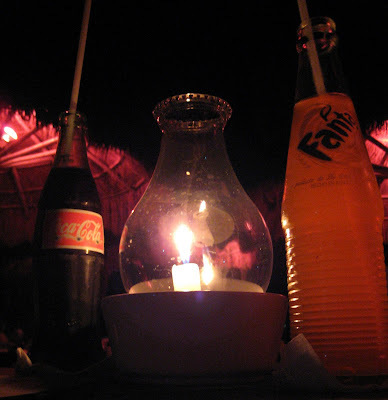 I’m not often a soda drinker, but when you’re in Mexico, you really need to play it safe and only drink things out of bottles and cans. I wanted apple soda again, but like other places in Mexico which are geared towards tourists, they didn’t have any. I was irked again, but settled on my second favorite choice, Fanta! Again, these are made with real sugar and not corn syrup. That makes them even sweeter than the ones we’re used to. 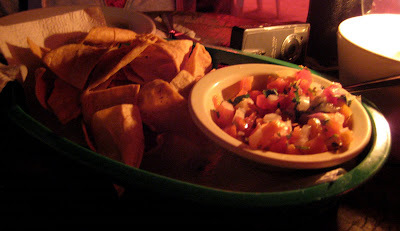 When in any restaurant in Mexico, it seems you get complimentary chips and pico de gallo. This is a custom that I could totally get used to. Everyone in the US should do this too! We went out pretty late, and I couldn’t wait until we got to the restaurant, so I actually ate a real dinner at the condo. So once we got to the restaurant, I didn’t have much room. That’s why I just ordered the lime soup. R got a bowl too. 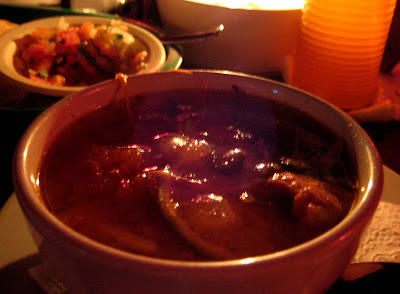 It was basically tortilla soup but not as thick. It was a lighter broth. We both liked this a lot. R got the surf and turf. 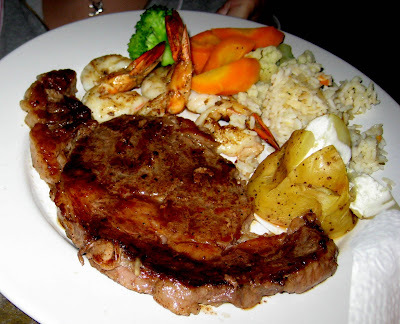 It was a giant piece of meat along with 3 huge shrimp that had been butterflied. It came with veggies and a potato with sour cream. R had asked for rice instead of the veggies, but they gave her rice along with the veggies. She wasn’t eating the broccoli and cauliflower, so I gobbled them up. After a few days in mexico, and not having eaten any vegetables, my body was craving them. And since they were cooked, they were totally safe to eat! Whoo hoo! Eating on a beach with sand between your toes, while looking at stars in the pitch black sky, is rather luxurious. Oh, and the karaoke was funny too.